Fit for high altitude: are hypoxic challenge tests useful? Altitude travel results in acute variations of barometric pressure, which induce different degrees of hypoxia, changing the gas contents in body tissues and cavities. Non ventilated air containing cavities may induce barotraumas of the lung (pneumothorax), sinuses and middle ear, with pain, vertigo and hearing loss. Commercial air planes keep their cabin pressure at an equivalent altitude of about 2,500 m. This leads to an increased respiratory drive which may also result in symptoms of emotional hyperventilation. In patients with preexisting respiratory pathology due to lung, cardiovascular, pleural, thoracic neuromuscular or obesity-related diseases (i.e. obstructive sleep apnea) an additional hypoxic stress may induce respiratory pump and/or heart failure. Clinical pre-altitude assessment must be disease-specific and it includes spirometry, pulsoximetry, ECG, pulmonary and systemic hypertension assessment. In patients with abnormal values we need, in addition, measurements of hemoglobin, pH, base excess, PaO2, and PaCO2 to evaluate whether O2- and CO2-transport is sufficient. Instead of the hypoxia altitude simulation test (HAST), which is not without danger for patients with respiratory insufficiency, we prefer primarily a hyperoxic challenge. The supplementation of normobaric O2 gives us information on the acute reversibility of the arterial hypoxemia and the reduction of ventilation and pulmonary hypertension, as well as about the efficiency of the additional O2-flow needed during altitude exposure. For difficult judgements the performance of the test in a hypobaric chamber with and without supplemental O2-breathing remains the gold standard. The increasing numbers of drugs to treat acute pulmonary hypertension due to altitude exposure (acetazolamide, dexamethasone, nifedipine, sildenafil) or to other etiologies (anticoagulants, prostanoids, phosphodiesterase-5-inhibitors, endothelin receptor antagonists) including mechanical aids to reduce periodical or insufficient ventilation during altitude exposure (added dead space, continuous or bilevel positive airway pressure, non-invasive ventilation) call for further randomized controlled trials of combined applications. Idoneità all’alta montagna: i test all’ipossia sono davvero utili? Portarsi in alta quota implica variazioni in acuto della pressione barometrica che comportano vari gradi di ipossia, modificazioni nel contenuto di gas nei tessuti corporei e nelle cavità. L’aria non ventilata contenuta nelle cavità può indurre barotraumi del polmone (pneumotorace), dei seni paranasali e dell’orecchio medio, con possibile dolore, vertigine e perdita dell’udito. Gli aerei commerciali pressurizzano le loro cabinead un equivalente di circa 2.500 m di altitudine. Questo comporta un aumento del drive respiratorio che può giungere a dare gli stessi sintomi dell’iperventilazione su base emotiva. Nei pazienti con patologie respiratorie preesistenti, con malattie polmonari, cardiovascolari, pleuriche, neuromuscolari toraciche o correlate all’obesità (es. : apnee ostruttive nel sonno) lo stress ipossico supplementare può portare all’insufficienza respiratoria o cardiaca. La valutazione clinica prima dell’esposizione alla quota deve perciò essere specifica per la patologia ed includere spirometria, pulsossimetria, ECG, valutazione della pressione arteriosa sistemica e polmonare. Nei pazienti con valori anormali si rendono necessarie ulteriori valutazioni di emoglobina, pH, eccesso di basi, PaO2, e PaCO2 per valutare se il trasporto di O2 e di CO2 sia sufficiente. Piuttosto che il test di simulazione dell’ipossia da alta quota (HAST), che non è privo di pericoli per i pazienti in insufficienza respiratoria, preferiamo in prima battuta un test iperossico. Infatti il supplemento di O2 in normobaria ci fornisce le informazioni sulla reversibilità acuta dell’ipossiemia arteriosa e sulla riduzione di ventilazione e pressione arteriosa polmonare, così come sull’efficienza del supplemento di O2 necessario durante l’esposizione in alta quota. In caso di risultato inconclusivo la ripetizione del test con e senza O2 in camera ipobarica rimane il gold standard. Il crescente numero di farmaci per il trattamento dell’ipertensione polmonare acuta da alta quota (acetazolamide, desametasone, nifedipina, sildenafil) e da altre eziologie (anticoagulanti, prostanoidi, inibitori della fosfodiesterasi-5, antagonisti dei recettori per l’endotelina), compresi i supporti meccanici per ridurre la ventilazione a carattere periodico o insufficiente durante l’esposizione all’alta quota (spazio morto, pressione positiva continua o bilevel, ventilazione non invasiva) richiedono decisamente un maggior numero di studi controllati e randomizzati sulle loro azioni combinate. Altitude exposure became an increasingly common phenomenon during the 20th century due to the popularity of various sporting activities (skiing, mountaineering, trekking) and greater availability of transport facilities (air planes, cars, trains, cable cars). It is the purpose of this article to focus on the possible dangers during acute altitude exposure of normal subjects and patients suffering in particular from respiratory disorders. To be able to advise on health issues and the risk of possible accidents, the physician should not only know the patient's current medical condition but also the duration and the type of the intended altitude exposure with its specific hazards . We distinguish illnesses due to rapid barometric pressure changes according to whether they occur under conditions of acute, subacute or chronic altitude exposure and whether they occur in normal subjects or patients with pre-existing lung and/or respiratory pump diseases (Figure 1). Reduction of O 2 - and N 2 -partial pressures in inspired air at btps conditions (100% saturated water vapour pressure depends only on temperature) with increasing altitude exposure (decreasing barometric pressure). Altitude diseases due to hypoxia can be compensated by O2-breathing and/or travelling in pressurized cabins. A sudden cabin pressure loss of commercial air planes at altitudes above 5,000-6,000 m or a rapid ascent to this altitude breathing air under ambient pressure can lead to decompression illness similar to that recognised in diving accidents. Acute hypoxic exposure (balloon rides) may induce signs of emotional hyperventilation, problems to speak, to calculate followed by dizziness, nausea and vomiting, but also uncritical euphoria. This situation can be simulated in hypobaric chambers to demonstrate the danger of altitude hypoxia to pilots and to study patients at risk with or without O2 breathing [2–5]. AMS affects 10-40% of lowlanders ascending to moderate altitudes above 2,500 m and 60% of subjects who reach altitudes of 4,000-5,000 m within a few hours. Physical fitness does not protect against any high altitude related illnesses. The incidence of AMS depends on ascent rate, whether the journey is made by climbing or travelling by plane (La Paz, Bolivia airport is at 4,100 m), car or train (the Chinese Tibet railway reaches 5,000 m). The AMS-symptoms start generally 6-12 hours after arrival at altitude with headaches (in mild to moderate cases with good response to analgesics), loss of appetite, nausea, vomiting, fatigue, insomnia and weakness. The Lake Louise scoring system allows the severity of AMS to be graded (see Table 1) . The heel-to-toe walking test is an additional check of objective neurological signs such as ataxia. Mild to moderate AMS disappears within 1-2 days with ongoing acclimatisation. The development of somnolence and cognitive defects are signs of high altitude cerebral edema (HACE), which may result in progressive unconsciousness, coma and death within 1-3 days due to herniation of the brain. It requires adequate treatment whenever possible by immediate descent to lower altitude. The rapid response of symptoms (headache with no response to analgesics, low grade fever, dizziness, ataxia, altered consciousness, confusion, impaired mentation, drowsiness, stupor, coma) to oxygen and steroids are consistent with the patho-mechanism of a vasogenic edema . The scoring system tries to quantify the severity of acute mountain sickness (AMS). A score (sum of the points) of 3 or more on the self-reported symptoms section, or for the combined self-reported questionnaire and clinical assessment of more than 3, while at altitude above 2,500 m, indicates AMS. HAPE develops at altitudes above 2,500 m. It is a high-permeability pulmonary edema caused by elevated pulmonary capillary pressures due to alveolar hypoxia . It may affect primarily only one lung. The initial onset is usually at night and not related to the frequently observed periodic breathing at altitude, which is a major cause of poor sleep quality. This so-called Cheyne-Stokes breathing is common in normal subjects at altitude and disappears, like AMS, during the first three nights. Chronic periodic breathing has also been observed above 4,500 m lasting for weeks. 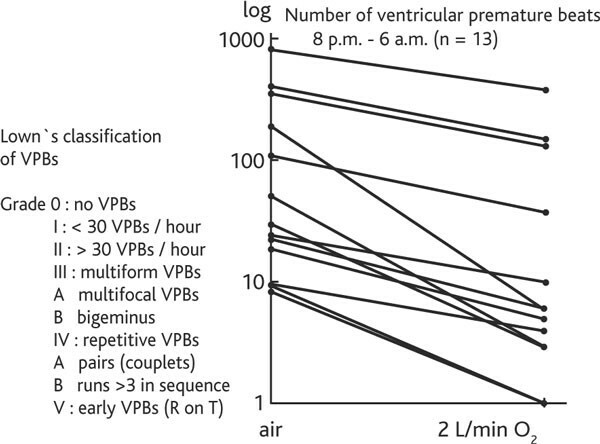 Recent studies showed that HAPE is more frequent in subjects with patent foramen ovale (PFO) who develop at altitude an increasing right to left shunt due to the hypoxic pulmonary vasoconstriction. In general the mean O2-saturation at normal barometric pressures is lower in subjects who developed HAPE at altitude compared to HAPE-resistant climbers. It is not clear whether closure of PFO prevents HAPE in these patients. The symptoms of HAPE are dry cough, decreased exercise performance, dyspnea at rest, orthopnea, cyanosis, tachypnea (> 25 breaths/min), tachycardia (> 100 beats/min), low grade fever, crackles on pulmonary auscultation and ultimately hemoptysis and death. A slow and gradual ascent with sufficient time and a recreational sleep before ascent is the best strategy for successful acclimatisation. Also the sleeping altitude prior to higher exposures and the individual susceptibility is important. To prevent altitude-related sickness, not more than a 500 m increase of sleeping altitude per day above 2,500 m is recommended, albeit there is little evidence to support this. For a safe ascent, the general recommendation is: climb high, sleep low, avoid doing more physical exercise than needed. If this is not possible for logistic or other reasons a prophylactic pharmacological treatment to prevent symptoms of AMS, periodic breathing and non-recreational sleep is recommended: acetazolamide (Diamox®) 125 mg the evening before ascent above 2,500 m and later twice daily for a stay of some days. Possible side effects are gastrointes tinal symptoms and paresthesias. Dexamethasone 4 mg can be taken the evening before ascent and later twice daily, especially in patients with a history of asthma and for prevention of HACE and HAPE. In subjects with a history of HAPE, 30-40 mg of slow release nifedipine may be given in addition. Mountaineers with severe sleep disordered breathing at altitude improve their nocturnal sleep quality by using benzodiazepines and/or a fitted mask with a dead space of 500 ml . Rest, avoidance of exertion, acclimatisation, analgesia, antiemetics, and azetazolamide 250 mg twice daily until descent are recommended. Treatment of periodic breathing and sleep disturbances is also primarily with acetazolamide which stabilizes nocturnal O2-saturation, reduces awakenings and hence improves sleep quality. In addition benzodiazepines taken before sleeping (Tenazepam® 10 mg) result in a significant decrease of periodic breathing without reduction of next-day reaction time, wakefulness, cognition and AMS-symptoms. Immediate descent is generally not indicated in mild forms of AMS. Immediate descent below 2,500 m is recommended. If available, O2 with or without pressure bag should be administered. Drug therapy consists of acetazolamide 125 mg twice daily, or dexamethasone 8 mg and later 4 mg every 6 hours. O2 breathing in- or outside a pressure bag, and 10-20 mg slow release nifedipine and 8 mg dexamethsone every 6 hours are recommended . Against headaches and pulmonary hypertension, sildenafil should be administered (Revatio®, Viagra®) as a vasodilator . Immediate descent below 2,500 m is recommended whenever possible. In all cases, dehydration is a risk and it is important to ensure a careful control of fluid balance. Some persons do not acclimatize to altitudes of 2,500-5,000 m. In these patients AMS-symptoms and sleep disturbances due to periodic breathing persist. Other subjects apparently well adapted to these altitudes for many months or years develop CMS, also called Monge's disease, characterized by excessive production of red cells (with the risk of thromboembolic complications), hypoventilation, fatigue, dyspnea, cyanosis, clubbing of the fingers and leg edema with cor pulmonale. If the patient descends to lower altitudes, preferably at sea level, these symptoms disappear within months without need for further treatment. It seems that increasing the respiratory dead space by a fitted mask improves disordered breathing and might improve erythrocytosis and pulmonary hypertension also in CMS . The Pickwickian-like syndrome is characterized by a primary depression of breathing without upper airway obstruction, such as in patients with obstructive sleep apnea syndrome (OSAS). The diagnosis requires exclusion of other causes of chronic respiratory insufficiency such as chronic obstructive pulmonary disease (COPD), obesity related hypoventilation or primary heart diseases causing polycythemia. CMS was first described in 1928 in mine workers living in the Andes of south America at an altitude between 3,000 and 5,000 m. Chronic altitude exposure during pregnancy leads to a reduced birth-weight of the child. 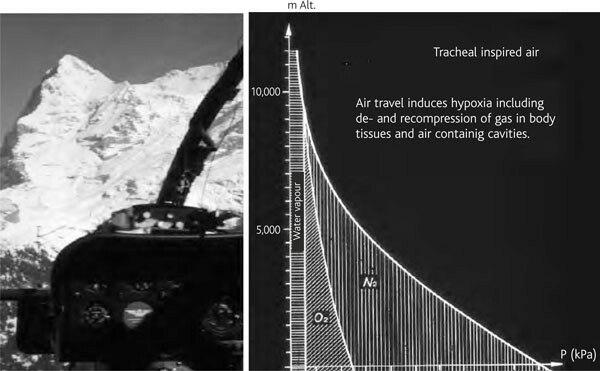 Deliveries at altitudes above 2,500 m for non-residents (also in aircraft) have an increased risk of neonatal death compared to non-hypoxic environments (early closure of ductus botalli and hypoxic vasoconstriction of the placenta vessels). Children exposed to high altitude have less periodic breathing at night than adults. Diseases of the lung and/or respiratory pump affect the O2 and CO2 transport which is further impaired by altitude exposure. Prophylactic recommendations and measures require disease-specific evaluation of these patients prior to high altitude travel. The British Thoracic Society (BTS) recommendations give detailed advice for doctors dealing with patients suffering from respiratory disorders who are planning air travel. Two billion passengers currently fly worldwide each year on commercial planes, about 5% having problems [13, 14]. Flying with no or partial compensation of the environmental barometric pressures at cruising altitudes should be known in advance as well as the intended and final altitude of the travel (landing place). Previous episodes of complications (the need for supplemental oxygen, pulmonary hypertension, asthma attacks, emotional hyperventilation, thrombo-embolic and cardiac diseases), decompression and recompression symptoms during altitude travel (difficulties in ventilating the middle ear and the sinuses), previous pneumothorax, obstructive and restrictive ventilatory defects and other causes of respiratory impairment should be carefully evaluated (lung function tests and pulse oximetry) during the medical consultation. The BTS-guidelines recommend the hypoxic altitude simulation test (HAST) breathing 15% FiO2 under normobaric conditions in patients with respiratory insufficiency, if they present at sea level with a SaO2 below 92% (PaO2 67-73 mm Hg) and/or additional risk factors (hypercapnia, FEV1 < 50% pred, cardiac disease), if a hypobaric chamber exposition (the ideal test) is not possible, which gives also information on possible barotraumata. We prefer in these patients to administer first supplemental O2 (primum nihil nocere) and to control the possibility to reach normal values of blood gases under normobaric conditions (Figures 2 and 3), if necessary in the sleep laboratory, to exclude critical hypoventilation at higher O2-flows and the need for non invasive ventilation. A one night supplemental O2 challenge test provides also more meaningful information than the HAST about the long term adaptation of hypoxic patients who intend to travel for extended periods by plane, car or train in hypoxic environments. It may be important to correct for anemia (Hb), because the O2-content of the blood is more informative for assessing O2 delivery to the tissues than SaO2 and PaO2-values. 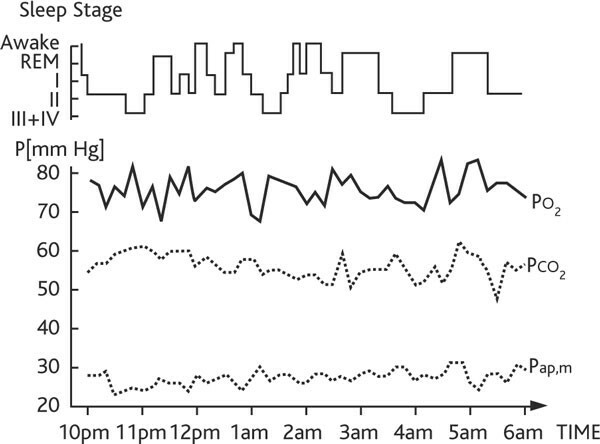 ECG recordings breathing supplemental nasal O2 (2 L/min) compared to the night without shows in many COPD-patients also a dramatic fall of hypoxia-induced ventricular premature beats (Figure 4). 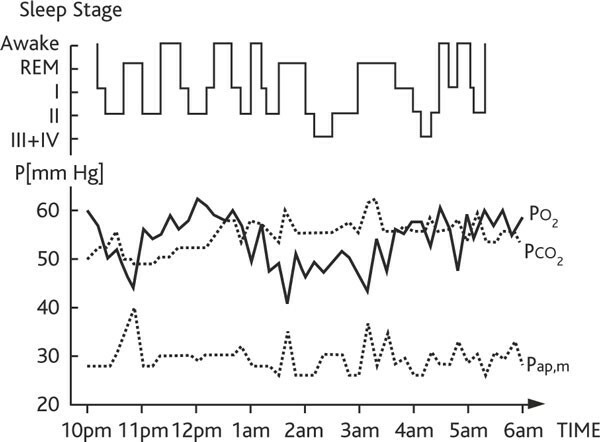 Polysomnography of a copd patient breathing 2 l/min nasal air at night. The patient shows a poor sleep quality due to frequent awakenings, and continuous hypercapnic (transcutaneous PCO2), hypoxic (transcutaneous PO2) and pulmonary hypertension (mean pulmonary artery pressure, Pap, m) recordings. The same copd patient as in figure 2 breathing 2 l/min supplemental nasal O 2 at night. Sleep quality and pulmonary hypertension are improved, arterial hypoxemia is normalized with unchanged hypercapnia. This patient could tolerate a 7 hour flight breathing 4 L/min nasal O2 at rest in a commercial aircraft with a cabin pressure equivalent to an altitude of 2,500 m without additional mechanical ventilatory support. Reduction of ventricuralr premature beats (vpbs) during 2 l/min O 2 breathing at night in 13 copd patients. The ECG recordings during the night when breathing 2 litres nasal O2/min compared with the night breathing only air show a significant reduction of ventricular premature beats in all 13 COPD patients and allow an additional risk evaluation (vis-à-vis Lown's classification) of the intended altitude exposure. Pneumothorax and other forms of "trapped air"
Air in the pleural cavity will expand during ascent and cause tension pneumothorax if it cannot escape through a chest tube, preferably equipped with a one-way valve (Figure 5). Patients with residual "trapped air" after thoracic surgery or incompletely expanded lungs and captured air in pleural or other closed air-containing spaces in the body should not be exposed to rapid altitude changes. Pneumothorax management fit for high altitude transport. Closed (non-ventilated) air spaces expand with increasing altitude (= closed pneumothorax) and shrink during descent. 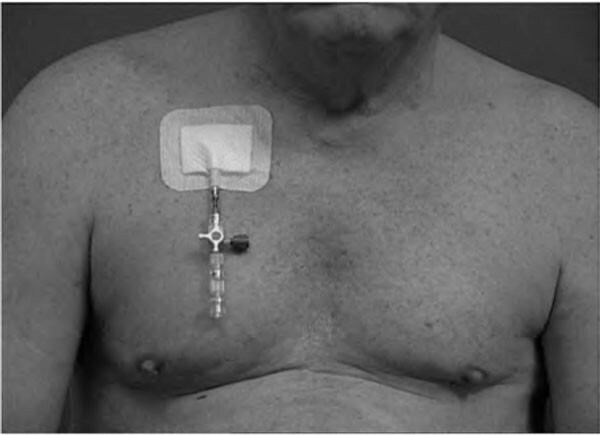 Therefore patients with pneumothorax need a chest tube with one way valve which also prevents tension pneumothorax due to ambient pressure reduction during various altitude exposures (MATTHYS DRAIN®). Exposure of patients to moderate altitude, (such as in Davos, Switzerland or Denver, US) breathing dry air without strenuous exercise tends to improve asthmatic symptoms, probably because of the lower allergen load. This is especially the case for house dust mite sensitive subjects, because the house dust mite cannot reproduce at altitude levels with low humidity. Acute exposure to higher altitudes or breathing cold air during exercise may trigger hyperventilation-induced or so-called exercise-induced asthma. Longer stays at altitudes of more than 4,000 m generally reduce the bronchial hyper-responsiveness of mildly asthmatic patients . Asthmatic subjects should maintain their pre-existing 'controller' medication and be equipped with an adequate supply of 'rescue' medications in the form of inhaled bronchodilators and oral steroids with appropriate instructions on their use. Breathing cold dry air through a face mask may help to humidify and warm the air entering the upper airways to BTPS-conditions and hence reduce broncho-constriction and airway inflammation. It is not uncommon in non-asthmatic subjects, as a result of the increasing hypoxic drive, to develop clinical signs of an emotional hyperventilation syndrome without bronchial obstruction and/or a vocal cord dysfunction syndrome. It is possible to differentiate these "asthma" patients often clinically with the help of a stethoscope. HAPE is a consequence of hypoxic pulmonary vasoconstriction (HPV) and may be associated with other diseases that cause a significant reduction of the pulmonary vascular bed . These include interstitial and vascular lung diseases (primary forms of pulmonary hypertension and thromboembolic pulmonary diseases). Patients with lung diseases associated with pre-existing pulmonary hypertension (mean PAP > 25 mm Hg at rest) are advised against high altitude travel. If travel at altitudes above 2,500 m is unavoidable, supplemental oxygen should be administered in all patients who have pulmonary hypertension at sea level. The non-hypoxic component of pulmonary hypertension should be treated according to the therapy necessary for the specific lung disease under normobaric conditions. If the patient has no pre-existing pharmacotherapy for pulmonary hypertension they should be given as prophylaxis slow release nifedipine (20 mg b.i.d.) for the duration of the stay at altitude. Alternatives, depending on the underlying lung disease, include sildenafil, tadalafil and dexamethasone to reduce the hypoxic increase of pulmonary hypertension due to altitude exposure. The acute therapeutic response of phosphodiesterase-5 inhibitors, cortico steroids, calcium channel blockers and other pulmonary vasodilators (bosentan, iloprost) makes it impossible to predict the long-term effect of these drugs on pulmonary artery pressure either at sea level or at altitude (16). The situation in which patients with COPD are most often exposed to altitude is when flying (Figure 6), but some times they are also exposed as long-term residents. An important issue for them is the presence of bullous lung disease. In contrast to decompression in divers the expansion of these structures during altitude exposure does not appear to be a risk for pneumothorax. Increases of pulmonary artery pressure (pulmonary hypertension) are dependent on the initial pressure at departure level, the possibility of recruitment of the pulmonary vascular bed and the availability of oxygen to compensate the alveolar hypoxia induced vasoconstriction. 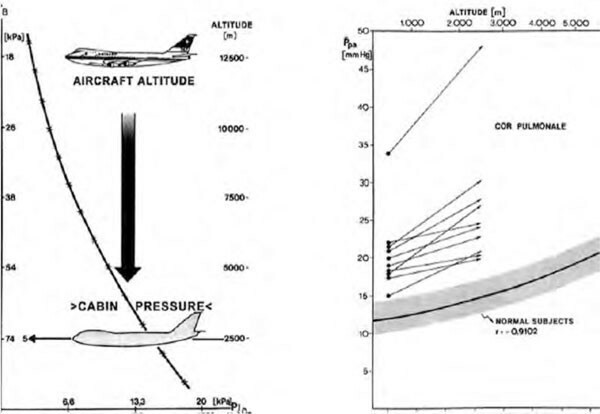 Mean pulmonary artery pressure (pap) above 30 mm hg excludes from flying without O 2 increases in all 10 copd patients exposed to a cabin pressure equivalent to an altitude of 2,500 m above sea level. All patients increased their mean PAP far more than normal subjects range. One patient had a pre-flight PAP of more than 30 mm Hg (complete vascular recruitment) and could not tolerate the altitude exposure. Residual volume correlated best with PAP, all patients fell asleep during the hypobaric exposure and showed a decrease in FEV1 from 1.08 to 0.78 L, the FEV1/IVC ratio diminishing from 45.7 to 40.2%. Arterial hypoxia and alveolar arterial O2-difference did not restore pre-exposure levels or mean PAP one hour after altitude exposure. From . Since non-invasive pulmonary artery pressure measurements with ECHO are not easy to perform in COPD patients, spirometry is recommended. Patients with FEV1 < 1,5 L should be assessed with pulsoximetry and an arterial CO2 measurement. These allow to detect hypoxemia and hypercapnia today also non-invasively. If supplemental O2-breathing (2-4 L/min) does not lead to a sufficient O2 saturation of 94% (equivalent to 70-75 mm Hg PaO2) at the altitude level of assessment, the patient should not be recommended for hypoxic exposures above 2,500 m.
The same evaluation criteria can be applied to patients with cystic fibrosis . Patients with hypercapnic ventilatory failure (global respiratory insufficiency) at sea level are generally not able to sustain the increased hypoxic drive at altitude without additional oxygen breathing. Often they need also ventilatory support (non invasive ventilation). An optimal antiobstructive inhalation therapy with tiotropium bromide, indacaterol, topical steroids and possibly oral theophylline, which has also a positive effect on AMS, should be established . ILD generally present with hypoxemia and normoor hypocapnia. If at rest and during exercise supplemental oxygen breathing restores normal arterial pO2 values at sea level, these patients can travel to moderate altitudes without problems as long as they do not also suffer from pulmonary hypertension. In contrast to obstructive lung diseases the response of pulmonary artery pressures on O2-breathing is more limited in patients with ILD than in those with COPD (Figure 7). The restriction of the vascular bed in ILD patients is generally less functional (alveolar hypoventilation induced) but more structural. Pulmonary vasodilators (nifedipine, sildenafil) other than supplemental O2 have limited therapeutic potential, but if it can be demonstrated in an acute setting that one or a combination of these drugs lowers pulmonary hypertension, they should be administered especially for short altitude exposures . Dependency of mean pulmonary artery pressure (pap) response on O 2 -breathing as a function of residual volume (rv) and airway resistance (raw) % predicted. Legenda: open circles: baseline at; full circles: on oxygen. A: The response of mean PAP on O2-breathing is lower in interstitial lung disease patients with low residual volume (RV% pred) and subnormal airway resistance (RAW %pred) compared to patients with increased airway resistance and over-inflation. 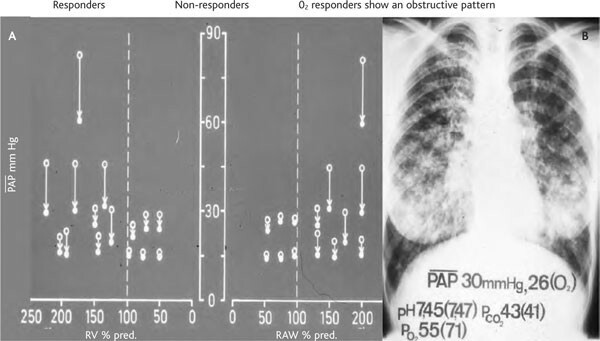 B: Chest x-ray of a typical patient with interstitial lung disease variations in PAP and blood gases between baseline conditions and when breathing O2 are reported. Patients with known thromboembolic complications, including smoking females with underlying coagulopathy and/or oral contraceptive use, are at increased risk during long distance flights or bus travel or other activities with a high degree of immobility. Restricted leg movement, venous occlusion (backpacking) and dehydration should be avoided. Any anticoagulant therapy started at sea level should be continued at altitude together with all other drugs prescribed to reduce pulmonary hypertension and disease-specific symptoms. There are anecdotal reports that lung emboli after thoracic surgery are less frequent if the operation is performed above 1,800 m compared to in lowland hospitals. Few studies have examined patients with respiratory pump disorders. Patients needing non-invasive ventilation (NIV) as a consequence of pump failure, alone or in combination with lung diseases and respiratory muscle fatigue, are generally not fit for travelling to altitudes above 2,500 m. They should also avoid long distance flights without supplemental O2-breathing and the support of a mechanical ventilator. Patients with this syndrome are at risk of cor pulmonale and hence acute right heart failure under an additional hypoxic stress at altitude inducing more pulmonary vasoconstriction. Nocturnal hypoxemia (especially during REM sleep) due to obesity induced hypoventilation predisposes to both AMS and HAPE. Pulmonary artery pressures at altitude increase in proportion to the body mass index (BMI > 30 kg/m2, PaCO2 during the day > 45 mm Hg). Patients without daytime pulmonary hypertension who need only continuous positive airway pressure (CPAP) or non-invasive ventilation (NIV) at night can travel to moderate altitudes with their devices, but should also get prophylactic drug therapy as needed. Patients with OSAS develop already subclinical HAPE at moderate altitudes of 2,500-3,000 m . Their symptoms of AMS benefit from 750 mg/d acetazolamide as well as fluid retention and systemic blood pressure elevation. Pulmonary gas exchange improved during the verum compared to the placebo night . Patients with pulmonary hypertension and/or day time hypoxemia at sea level need slow release nifedipine 20 mg b.i.d. with supplemental oxygen at night. The hypoxemic ventilatory response is reduced in patients who have undergone endarterectomy with damage to the carotid body. These patients may show no increase of ventilation under hypoxic stress and therefore they have a high risk of developing AMS and HACE. If these patients need to travel at altitude, they should be first tested for their hyperoxic ventilatory response, to verify if there is a supplemental O2-induced hypoventilation. Patients with muscular dystrophies, diaphragmatic paralysis, amyotrophic lateral sclerosis (ALS), Guillain-Barré syndrome or severe kyphoscolioses have limited ability to increase their ventilation as required for altitude adaptation. Often they first hypoventilate during sleep at night and later during day time at sea level and need non-invasive ventilation (NIV) or bi-level positive airway pressure (BiPAP). Any prior treatment with BiPAP or NIV should be continued at altitude. Nocturnal or even 24 hour supplemental O2-breathing may be indicated to avoid at altitude an additional alveolar hypoxia-induced pulmonary vasoconstriction. Patients with kyphoscoliosis and pulmonary hypertension need additional oxygen combined with slow release nifedipine 20 mg b.i.d. In patients with bilateral diaphragmatic paralysis NIV is already indicated during moderate altitude exposure. In conclusion, what do we need to evaluate if a patient is fit for altitude exposure? In the first instance, the patient's clinical diagnosis, medical examination and history (former experience with altitude exposures) are required. Specific examinations that should be carried out are: pulsoximetry (Hb, PaCO2), spirometry, chest X-ray, RR (echocardiography). If one or more of these are abnormal, for altitude exposures above 2,500 m further tests should be carried out on air- versus O 2 -breathing: SaO2-, PaCO2-, PAP-response under supplemental O2-breathing. If still abnormal, prophylactic drug therapy is recommended: acetazolamide (250 mg b.i.d. ), dexamethasone (2 mg b.i.d. ), sildenafil (20 mg b.i.d.) [11, 23], nifedipine slow release (20 mg b.i.d.). In the case of ventilatory (respiratory pump, periodic breathing) insufficiency with and without lung and heart failure: polysomnography should be performed in all patients, if necesssary with and without supplemental O2-breathing and/or mechanical aids at night (CPAP, BiPAP, IPPV, added dead space) and drug therapy [9, 12, 20, 22]. The Matthys-Drain® was developed by the author for the drainage of air and liquid from body cavities, and is produced by info@bresch-medizintechnik.de.